For nearly a quarter-century, Madrona Venture Group has invested in and nurtured the region’s tech industry. It intends to do even more. VENTURING FORTH. Tom Alberg, left foreground, started Madrona Venture Group in 1995 with three other partners. Today, the firm employs 30. This article appears in print in the October 2018 issue. Click here for a free subscription. A lot of tech giants call the Seattle region home, but one small company most Seattleites haven’t heard of has an outsize impact on the regional tech scene. Since its founding in 1995, Madrona Venture Group has been the primary early investor in many successful startups. Since 2016, four of them have gone public: Redfin, Smartsheet, Apptio and Impinj. Madrona cofounder Tom Alberg was also an early investor in Amazon. What’s more, Madrona has evolved from a straightforward investment firm into a company that nurtures the companies it invests in. It has also developed a platform for launching its own startups. Madrona is decidedly different from your traditional VC firm. Besides a remarkable record for recognizing promising tech firms, it has always kept a tight geographical focus, with about 80 to 90 percent of the $1.6 billion it has raised being invested in Pacific Northwest entrepreneurs and companies. HEAD START FOR TECH.The Create33 space designed by Madrona Venture Group includes conference rooms, lounges and a video production studio. For the first five years, Madrona’s investments were made solely with funds from its four founders — Alberg, Paul Goodrich, Gerald Grinstein and William Ruckelshaus. Madrona’s founders also embraced early seed funding of companies. “We like to talk about being involved from day one,” says Tim Porter, a Madrona managing director. Since launching 23 years ago, Madrona has expanded to a staff of 30, including specialists who analyze technologies and markets and advise companies on hiring and personnel, as well as financial advisers, information technology experts and communications professionals. The help has been well received by companies Madrona invests in. “As a first-time founder, what you want in a venture capital firm is a partner — you want someone who will help you with the hard part and cheer you on through the good part,” says Amy Nelson, founder and CEO of The Riveter, a company providing “female-forward” workspaces and support for entrepreneurs and freelancers. Launched in Seattle in 2017, it has opened two locations in Los Angeles and opened in Bellevue in August. Aaron Easterly, CEO of Seattle-based Rover.com, calls Madrona the “voice of reason” that helped make his pet-sitting and dog-walking service, founded in 2011, a success. “You have to be a little bit delusional to be an entrepreneur because the probability that you succeed is objectively really small, but being delusional is not conducive to making thoughtful decisions,” he explains. With Madrona’s advice and patient backing, Easterly says, Rover.com didn’t rush to market with its online platform. That patience has paid off. Rover.com now has 375 employees, $350 million in annual revenue and a presence in more than 10,000 American communities. Besides funding, Mader says Madrona gave Smartsheet access to its “talent ecosystem,” providing specific hiring recommendations for open positions. Mader also appreciates the networking offered by Madrona’s regular hosting of events, such as an annual CEO summit that brings together leaders of tech companies. “This is a way for earlier-stage entrepreneurs to get exposed to companies of scale, not necessarily in the context of trying to pitch them but to learn from them,” Mader explains. Through the economic ups and downs of recent years, Mader adds, Madrona has been a steady guide. “That’s one thing I do not take for granted,” he says. 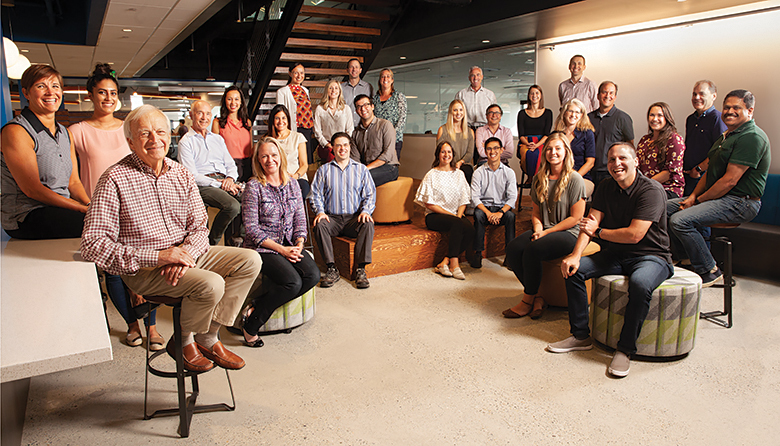 Madrona’s close involvement with companies it invests in has spurred the firm to go beyond finding, funding and nurturing. Rover.com, in fact, originated within Madrona Venture Group at the firm’s 34th-floor headquarters in downtown Seattle in an informal organization devoted to encouraging new startups. Easterly was an “entrepreneur in residence” at Madrona when, he says, one of the company’s managing directors came up with the idea for Rover.com. playing a more active role, Alberg notes, it has become far more competitive, even for well-established companies like Madrona, to make investments in strong startups. In September, Madrona Venture Labs launched a new program for startups called MVL Accelerator, which will give selected teams $100,000 and a three-month course to help them launch with support from Madrona’s network of investors and entrepreneurs. Madrona Venture Labs and the accelerator will both be based at Create33, a new space where startups and potential startups can work and network. It occupies the entire 33rd floor directly below Madrona — the two are connected by a new staircase — and offers wired workspaces for more than 100 personnel. Despite its close ties to Madrona, Create33 is designed to operate independently. “What I really want to do is recreate the old salons,” says Executive Director Micah Baldwin, a tech entrepreneur who got his start at Amazon Web Services. Create33’s 20,000-square-foot space will house some companies Madrona has invested in, but Baldwin expects about half the space to be occupied by firms with no funding ties to Madrona. It had signed up six businesses by the end of August. Baldwin says that while Create33 will charge for use of its space, it intends to keep costs low. For example, an individual entrepreneur can use an unreserved workspace and conference room for as little as $100 per month. Interested parties from Silicon Valley and elsewhere can pay for a “drop-in membership” that gives them access to Create33’s 20 conference rooms, two boardrooms, an event space, and a shared kitchen and collaboration space. Among Madrona’s partners in the effort are Amazon Web Services in cloud computing, Perkins Coie and Fenwick & West in legal services, and Jones Lang LaSalle in real estate. The University of Washington’s Comotion innovation hub is also a partner, though not a sponsor. So, what’s in it for Madrona? Madrona’s geographic focus on the Northwest, its intimate involvement with companies it invests in and its expanding interactions with companies it hasn’t invested in speak to an awareness that the venture capital firm’s interests are closely tied to the interests of the broader community. While Silicon Valley has become a sort of perpetual-motion machine for tech startups, Jacobson says Seattle, for all its successful tech companies, still needs to build its ecosystem. He sees Create33 as an important piece of the puzzle in bringing together the region’s rich tech resources — including university researchers, entrepreneurs and existing tech companies.